Shrines registered with the Department of Religious Affairs, jingikan 神祗官, that were the dwelling places of the most important deities, kami 神. During important festivals, priests performed rituals called norito 神詞, which included reciting prayers of praise and invocations to the kami for protection from disasters feared by an agrarian society. The rituals were followed by the presentation of offerings to the gods by the government, nobility and chieftains. These included various kinds of cloth, food, white horses, weapons, rice wine and timber for new shrine buildings. This book presents, for the first time, a collection of ancient Japanese Shinto prayers in a format where English speaking readers can both understand the deep meaning of the translated text and can also pronounce the original Japanese words. Shinto is an ancient spiritual tradition, primarily practiced in Japan, which is now spreading its traditions to the western world. Its primordial rituals and traditions touch a deep chord within one's spiritual self. Shinto's focus on divinity of all beings and of all creation, on living with gratitude and humility, and on purification and lustration of one's self and environment will bring light and joy to any reader. The purpose of prayer and ritual as practiced in the Shinto tradition, is to reinsert ourselves into a divine state of being, not as a new position, but as an acknowledgement and reinforcement of what already exists. Ritual restores sensitive awareness to our relationship to the universe. Through purification and removal of impurities and blockages, we return to our innate internal brightness and cultivate a demeanor of gratitude and joy. Shinto rituals and prayers were created by ancient man over 2,000 years ago in a time when mankind was more intuitive about his relationship to this world. Because of this, the rites are archetypal and invoke deep emotion within the participants. 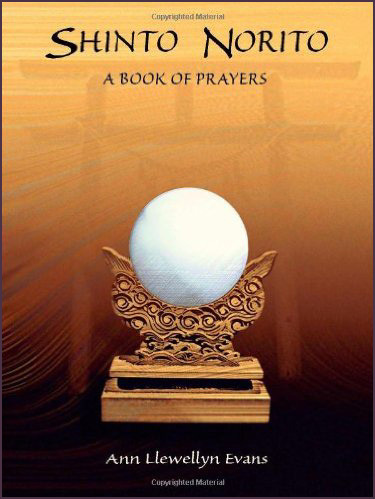 This book of prayers will introduce the western reader to the deep spirituality of Shinto, providing explanation of the spiritual tradition and practice and providing a collection of 22 prayers for use in personal meditation and devotions. These are liturgies or incantations, words written in a particular script that are then read by the ritual performer at certain ceremonies or festivals involving the kami. In general the classification norito is widely used to include auspicious words (yogoto) as well as the language for ritual purification (harae no kotoba). There are various theories regarding the meaning and etymology of the word norito, but the belief that nori is the nominalized form of noru "to declare" (announce important words in a mystical way), and the belief that to is a suffix associated with cursing or magical acts, such as kusoto "crime of spreading feces on things or polluting," togohito "cursing or damning (this word is of unclear meaning)," or kotodo "breaking relations with a spouse (also a word of unclear derivation)," is close to becoming the scholarly consensus. Additionally, other explanations concerning the etymology of this word exist such as one suggesting that norito comes from noritabegoto "declare and present words" (by Kamo no Mabuchi) or from noritokigoto "words declared and expounded" (by Motoori Norinaga), but these theories are not seriously considered today. The original form of the word is norito, but later koto "word" was affixed, and in the late Heian period a contraction in pronunciation resulted in the noritogoto being pronounced as notto . In ancient times the word norito was written in various ways such as 祝詞 or 詔戸言 (in the first book of Kojiki), or 詔刀言 (in the Nakatomi words of celebration), or 諄辞 (in Nihon shoki's portion on the Age of the Kami), or 告刀 (in Kōtai jingū gishikichō), or 法刀言 (in Ryō no shūge). When used as a legal term in proclamations, legal codes or ceremonies, the spelling was standardized as 祝詞. These characters were used in imitation of the Chinese term 祝文 "words read to the gods," with the character 詞 "utterances" exchanged for the original character 文 "written words." The origins of norito are believed to be extremely old and the fact that magical words were indispensable in the performances of rituals from antiquity can be witnessed in rituals found in Kojiki and Nihon shoki including the myth of the Heavenly cave (where the Sun goddess hides) wherein Amenokoyane no mikoto makes use of noritogoto. Also, in the legend depicting Ōkuninushi no mikoto's transfer of authority (kuniyuzuri) as seen in Kojiki, auspicious words (jushi) are used to start the divine fire used to cook food to be presented as divine offerings (shinsen). A great number of Norito have been produced since there appearance in documents dating to the ancient period and they are treated as Shintō classics and considered a template for the creation of norito in modern times but the main corpus of norito consists of a set of twenty-seven included in Book Eight of Engishiki which was compiled in the twelfth month of 927. These norito were employed at various ceremonies and rituals at the court which have been read and handed down and are referred to as Engishiki norito or Engi norito shiki. 27) Words of Praise Offered to the Kami by the Provincial Administrator of Izumo (Izumo kuni no miyatsuko). It is assumed that the twenty-seven types of norito mentioned above are preserved in a form that remains largely unchanged from the time they were presented to the court as a portion of the sixth book of Kōnin shiki, compiled in the fourth month of 820. Numbers 1, 7, 14 are liturgies offered in prayer for the longevity of the emperor's reign and a prosperous harvest of the five grains. Numbers 8 and 9 are liturgies offered in prayer for the tranquility of the emperor's palace, while 10 is the great purification that was offered twice a year to expiate transgressions and prevent disasters throughout the realm. These exquisite compositions were, along with the "age of the kami" section of Nihon shoki, considered to be essential works in the formation of Shintō thought and came to be regarded as sacred. Beginning in the medieval period norito came to be recited widely by among onmyōji (masters of Chinese yin-yang), individuals associated with shrines and even common individuals and, of these recitations, many continue to be used today. Number 27 is unique among and has characteristics that are not necessarily consistent with the other norito listed. In the case of number 27, the governor of Izumo (Izumo no kuni no miyatsuko), having been recently appointment to his post, would remain abstinent (kessai) for the period of one year while performing rites for the kami of Izumo. Subsequently, the governor would journey to the capital and present the jinpō (divine treasures) and the first fruits of the harvest to the court. These offerings would be received during a ceremony for the longevity of the imperial reign and the norito offered took the form poetry and consisted of a pledge of loyalty on the behalf of the governor of Izumo to the emperor and represents the height of development for these auspicious utterances (yogoto). Although they are not included among the norito found in Norito shiki, there are a number of other norito that are serve as historically important works from the ancient period. Notably, among these norito exists the auspicious utterances (yogoto) of the Nakatomi which were recited on the day the emperor ascended the throne and also recited at the great festival of the tasting of the first fruits (daijōsai, the norito is called amatsukami noyogoto, or "auspicious words for the heavenly kami"). These norito are contained in Taiki bekki, the journal of Fujiwara Yorinaga (1120-1156), under the entry for the first year of Emperor Konoe (1142) as words presented by Ōnakatomi Kiyochika, and in a text recited by Ōnakatomi Chikasada in the first year of Emperor Toba (1108) two reigns prior to Emperor Konoe (this norito is published in Nishida Nagao's Shintō-shi no kenkyū , volume 2 where he introduces a text copied by a shintō priest [negi ] of the Ise Shrine named Arakida Moritoki who produced a copied dated 1506-1516). Variously, these norito are also introduced in Nakatomi hissho copied in 1401 by someone in the Fujinami family, descendants of the Ōnakatomi, and can be found in Komatsu Kaoru's "Shin hakken no Fujinamike shozō: Nakatomi hissho (tenjin yogoto) no shōkai to kōsatsu" (Newly Discovered Documents of the Fujinami Family: An Introduction to and Consideration of the 'Nakatomi hissho tenjin yogoto' ). Furthermore, in the sixteenth volume of Engishiki under the entry for the Bureau of Divination (Onmyōrō) in the entry "Items for the Na Festival" there is a text (saimon) containing the lines recited for a ritual by onmyōji (masters of Chinese yin-yang) at this same festival on the last day of the twelfth month. There is some chronological breadth to the composition of the norito that appear in Engishiki, and it is also believed that certain liturgies like numbers 1), 7), and 10), have passed through several stages before reaching their present form. On the other hand, some liturgies such as numbers 3) and 4) first appear in festivals in 675, and number 27) was first presented in 716, and the place names found in these norito correspond to the historical period of Asuka and Fujiwara Capitals. By gathering clues such as these and comparing them with evidence such as is found in number 2) which was used in the festival of Kasuga shrine which was established in 768, or as in numbers 5) and 6) which were used in festivals established in the during the Enryaku era (782—806), assumptions can be made as to when these norito were first composed. There are also some who argue that the use of words like amatsu yashiro, kunitsu yashiro "shrine of heaven, shrine of the land" as found in numbers 1), 4), 7), 14), and in the Nakatomi yogoto have their origins in the Ōmi Code which was in force from 671 to 689. Regarding who had the authority to present norito to the court, in the myths contained in Kojiki, Nihon shoki and Kogo shūi, there is the tradition that Futodama, the founding deity (sojin) of the Inbe, was in charge of making offerings, and Amenokoyane, the founding deity of the Nakatomi, was in charge of reciting the norito (though some traditions state that Futodama also was in charge of recitation). Jingiryōmentions the recitation of Norito by the Nakatomi during the Kinensai and Tsukinamisai and preparation and distribution of paper offerings by the Inbe was the established practice. The foreword of Engi norito shiki states that of norito contained therein are to be recited by the Inbe in instances such as the Ōtonosai and Mikadosai, and Nakatomi perform the recitations for those not contained therein (naturally the Nakatomi do not read anything for numbers 11) and 27). Also, because the Nakatomi were primarily in charge of recitation of the Ōharae no kotoba, this later was called Nakatomi no harae. Providing a categorization of the styles of the norito as they appear in the Engishiki, there would be two large divisions based on how the norito ended. One group of norito would finish with statements such as "I announce: 'Give ear everyone to these words'"; "I announce that this concludes the presentation of this statement and words of praise"; and the other group's norito end with the statements such as "I state with great humility that this concludes the presentation of these statements of praise"; "With great humility I have presented these statements." The former take the form of a public pronouncement to people gathered together at the place of a festival and this is called senmyō(senge)-tai norito (edict style norito), while the latter is are statements presented directly to the kami called presentation-style norito. In the composition of norito, there exists a basic format in which the name of the kami to be worshipped or origin of the festival as it is derived from myth is given and followed thereby with statements praising the virtue of kami, the presentation of paper offerings and, lastly, entreaties are made of the kami. There are instances where norito from more recent time periods are lacking the portion concerning mythic origins. Although the means of expression is generally rather simplistic, amidst this simplicity one can witness the use of metaphors, enumerations, and reiterations, as well as rhetorical devices such as antonyms and antitheses. These norito formed the apex of virtuous and beautiful expression and epitomized cordiality and respect lending a solemn air to the recitation. Concerning the way in which norito were orthographically rendered, in order to ensure that norito would be pronounced correctly at ritual occasions, they were written entirely in Chinese characters but the word order itself was Japanese with nouns and pronouns as well as the stems of verbs and adjectival verbs written in Chinese characters of a slightly larger size and suffixes and particles as well as the inflecting parts of verbs are written in man'yōgana in a smaller size. 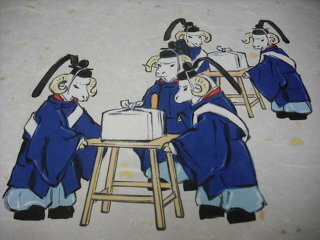 In other words, these norito were written in the senmyōstyle. This style of orthography was frequently used in the ancient period because it was markedly easier to ensure correct pronunciation during recitation than classical Chinese or Japanese-modified Chinese. Even after the general Japanese orthography had changed to a mixture of kanji and kana, the orthography of the norito still preserved the tradition of writing in the senmyōstyle. The paper these liturgies were written on was white washi (Japanese style paper), like torinokogami (Japanese vellum), hōshogami (a stout white paper), and sugiharagami (a lighter, thinner paper), and this paper was then folded generally in seven and one half folds. Even to this day, the paper used for imperial edicts that were presented to imperial shrines, shrines, and imperial mausolea by imperial messengers (chokushi ) follows the specifications established in Engishiki with the norito of Ise being presented on light blue paper and those of Kamo on crimson paper while other edicts are written on yellow paper. After the compilation of the Engishiki norito there have been various compilations of norito recited at specific shrines, especially in the middle ages, such as "Nenjū gyōji norito fumi (Kōtai jingū ) [Texts of liturgies recited at yearly events [Ise Shrine]," "Notsuto shidai " (Wakasa Hiko jinja), "Sumiyoshi Daijingū norito," "Hiesha norito kudensho." There are also norito recorded in Suwasha nennai shidai kyūki . Additionally, there are also records that contain fragmentary norito such as the "Miyanome saimon" fragment found in Shūkaisho and Shissei shoshō , as well as various norito from the Ise Shrines, Kamo, Iwashimizu, Hirano, Gion, Kitano, Kasuga and other shrines, known from works like Kōtai jingū nenjū gyōji, Taiki, Shōyūki, Chūshishō, Ruijū daibunin, Azuma kagami, Chōya gunsai, Kanchūki, Entairyaku, Yasutomiki, and Honchō seiki. Some of these medieval norito were simplified over time and became formalized, while others came to be used in conjunction with Chinese and Buddhist terminology. Also, while the Engishikinorito were recited at court by the Jingikan (Bureau of Divinities), it appears that these later norito were actually recited various popular shrine festivals. Even though we refer collectively to "norito" with one word, these recitations and utterances have undergone historical transformations, which made evident by the shear variety of norito that exist throughout Japan. Given this diversity, members of the Kokugaku (National Learning) movement sought to revive the older liturgies. It is at the hands of kokugaku scholars that the entire compilation of norito contained in Engishikibecame the object of study, and research and because of this initial efforts the study of norito experiences dramatic advances. The court, various shrines, and numerous households began writing liturgies based on the old precedent. Norito produced from the Meiji era on have been written in the same spirit of this restoration that characterized kokugaku. Among the extant copies of Book Eight of Engishiki, the Kujōke manuscript is recognized as the oldest surviving text, having been copied near the end of the Heian period. This manuscript does not contain the revisions that appear in later texts and the interlinear readings preserve the ancient style of kana. Next is the Urabe Kanenaga text from the Muromachi period, copied in 1523, which preserves an even older form of man'yōgana than exits in the Kujōke manuscript. Also, there is the Urabe Kanemigi text, copied in 1542, which is a manuscript belonging to a different branch of the Urabe. Concerning the production of commentaries and research regarding norito, from the Kamakura period, a number of Shintō scholars produced commentaries on the great purification liturgy, and these are contained in the three-volume work Ōharae kotoba chūshaku taisei. The comprehensive investigation into the complete commentaries of Engishiki began with Kamo no Mabuchi's Engishiki norito kai, a work based largely up the research conducted by Kada no Azumamaro and Kada no Arimaro. Mabuchi also put together a standard reference titled Norito kō. Additionally, there are also works such as Motoori Norinaga's Izumo no miyatsuko no kamuyogoto goshaku and Ōharae no kotoba kōshaku, and Suzuki Shigetane's Engishiki norito kōgi. 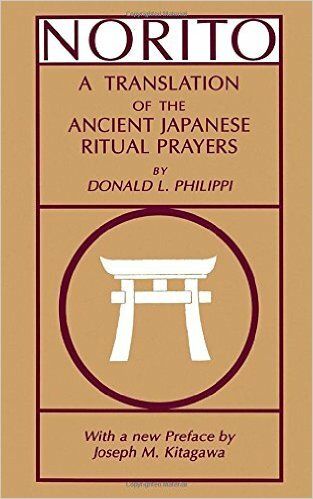 This volume presents the only English translation of the prayers of Japan's indigenous religious tradition, Shinto. These prayers, norito, are works of religious literature that are basic to our understanding of Japanese religious history. Locating Donald Philippi as one of a small number of scholars who have developed a perceptive approach to the problem of "hermeneutical distance" in dealing with ancient or foreign texts, Joseph M. Kitagawa recalls Mircea Eliade's observation that "most of the time [our] encounters and comparisons with non-Western cultures have not made all the `strangeness' of these cultures evident. . . . We may say that the Western world has not yet, or not generally, met with authentic representatives of the `real' non-Western traditions." Composed in the stately ritual language of the ancient Japanese and presented as a "performing text," these prayers are, Kitagawa tells us, "one of the authentic foreign representatives in Eliade's sense." In the preface Kitagawa elucidates their significance, discusses Philippi's methods of encountering the "strangeness" of Japan, and comments astutely on aspects of the encounter of East and West. "A welcome republication . . . of a group of important norito brought out by the Institute for Japanese Culture and Classics . . . The new Preface supplied by Kitagawa is . . .a subtantial essay worthy of attention in its own right. It scetches the cultural, historical, and religious contexts in which the earliest written collection of norito emerged"
. WKD : Summer Purification Ceremony (nagoshi 名越) . In Shinto, not only are the sins, pollutions, and misfortunes of the individual removed, but also evil and misfortune can be removed from a whole nation, life renewed, and the blessings of the gods brought down. The norito prayers used at the 大祓 Ôharae is called Ôbarae no kotoba. It was the duty of the Nakatomi clan to recite it, and so it is also called by the name Nakatomi no harae. Ôharae today is performed on the last days of June and December of each year.